you have the best bunny blog, every post is gold. but big & little! the most adorable! this took it to a new level of wonderful. 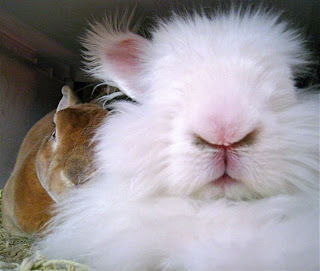 Big fur and little fur.....Does white bun have a static issue? But they are BOTH big and luscious creatures! can't wait to meet them in person. A leetle closer on thee leeps, please. So pink! Ooh, yes yes, closer on the pink lips!! So very kissable!! I love the the ears.. closer on the ears pleaaaase! ok thefluffies! i have my favorite ears pic somewhere...i've been looking in this computer but maybe it's in my other one...anyway if i don't find it soon i'll reshoot!